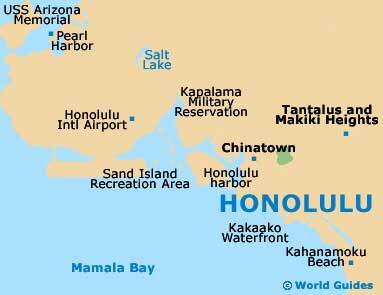 Honolulu is the capital and biggest city in the Hawaiian archipelago by far. Roughly 80 percent of all Hawaiian residents live here on the island of Oahu, making this the place to be based for anyone who needs a strong cosmopolitan anchor in their life. 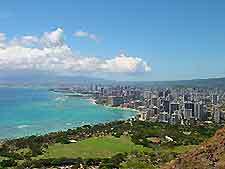 Properties for sale and rent in Honolulu are close to the best shopping, dining and surfing areas in all of Hawaii. This sort of premium exposure comes with a hefty price, and this is the most expensive place to buy homes or rent apartments in an area already known for high real estate values. The demand for property in Honolulu continues to rise, so buying a condominium or house here is still a good investment. Prices hold, especially for free-standing houses, but getting a mortgage has become difficult since the economic downturn set in. 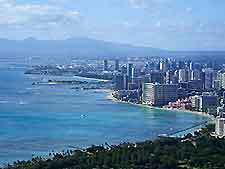 The most popular areas to live are on the resort-studded Waikiki Beach or around commercialised Ala Moana shopping strip. Serviced apartments and condominiums are widely available around Waikiki Beach, and many are operated by the area's leading resorts. They differ from standard hotel rooms in their style and atmosphere, as these units are typically more spacious and feature finer furnishings and amenities. These units are especially expensive, and they offer more attentive service than most hotels. In some cases, serviced condominiums can be more affordable than comparable hotel rooms, especially for continuous stays of a week or more. There are several property types in Honolulu. These include co-ops - most of which were built before the 1960s, free-standing family homes - usually with an attractive garden, and high-rise condominiums. The latter usually include a monthly maintenance fee of a few hundred dollars. Property is expensive because construction materials have to be brought in from the mainland. Savings are available by taking a unit without a view or in some cases, by purchasing 'lease-hold' property. This is built on land owned by one of many trusts that date to the days of the Hawaiian monarchy. Leases must be periodically renegotiated. Fee-simple property (no lease) is more expensive. Non-permanent residents are able to buy property with few hassles. Finding a knowledgeable real estate agent is essential to navigating the complex Honolulu real estate market. First-time buyers are easily confused by the dynamic that lease-hold property introduces. The best real estate agents can explain the complexities of the market and help to secure the best-value properties in Honolulu. Founded in 2001, this real estate company is locally owned and independent. It deals primarily in homes, but also includes luxury vacation properties in its portfolio. Gold Coast Real Estate represents properties across the greater Honolulu area, including condominiums, family houses and time-shares. Oahu Realty is centrally located in the Ala Moana shopping area, where it employs some 70 agents with connections in the best neighborhoods of Honolulu.